Toro Rosso's Russian driver Daniil Kvyat made a statement of intent as he became the youngest points scorer in F1 history by chalking up a top ten finish at the Australian Grand Prix. Rookie Russian driver Daniil Kvyat, driving for the Toro Rosso team in his first ever Formula 1 race, finished ninth at the Australian Grand Prix in Melbourne on March 16, in doing so becoming the youngest F1 driver to score points. In a remarkably confident performance, Kvyat finished the race in 10th place, before subsequently being upgraded to ninth following the disqualification of Red Bull’s Australian driver Daniel Ricciardo. At the age of 19 years, 10 months and 18 days, Kvyat became the youngest points scorer in F1 history, snatching the title that had previously belonged to current world champion Sebastian Vettel, who scored his first points in a U.S. Grand Prix in 2007 at the age of 19 years, 11 months and 14 days. Kvyat can feel justifiably proud of making his mark on the race in Melbourne. Toro Rosso, which in effect is a Red Bull feeder team, is light years away from the top teams in terms of its ability to compete. "Of course, I did not expect to score points in my very first race, so I am very happy. It was a very tense race. In the closing laps I could have improved my position but I had to go into fuel-conservation mode and give up the fight. Until next time," Kvyat told F1News.ru. "Previously, I have never had a race longer than 35 minutes, while this one lasted an hour and a half. I ran out of water early, so the closing laps were quite hard. It was a very intense afternoon and finishing my first race with a point is a great feeling. Everyone worked really hard and scoring points was a great way to end it," Autosport website quoted Kvyat as saying. Toro Rosso boss Franz Tost was delighted by Kvyat’s performance. "I am very happy for Daniil, who has become the youngest F1 driver to score points in his first race. It is very promising and I am confident that this is the first result in a long series. Now we need to concentrate on the next race in Malaysia, where we hope to build on this result and score points again," said Tost. The race was won, as was expected, by a Mercedes driver, though not by pre-race favorite Lewis Hamilton, but by Germany's Nico Rosberg, whose car was the epitome of reliability in Melbourne. Hamilton, who started the race in pole position, withdrew after two laps. "It felt as if only five of the six engine cylinders were engaged," Hamilton said later. Meanwhile, Red Bull's four-time world champion Sebastian Vettel, like Hamilton, was forced to retire from the race with engine problems after the first several laps. His fellow team member Daniel Ricciardo took second place, but did not remain in a podium position for long, as soon after the race he was disqualified for a fuel-flow rate infringement. In the end, second place went to Denmark's Kevin Magnussen, 21, racing for McLaren in his very first F1 race. Russian driver Vitaly Petrov, who raced in F1 from 2010 to 2012, said that Daniil Kvyat had excellent chances of succeeding in Formula 1. "Kvyat has an excellent chance of succeeding with Toro Rosso. He had many excellent races before F1, and he had good test runs during the race weekend,” Petrov was quoted by Russian daily Izvestia as saying. “He is already far more familiar with F1 than I was when I started my first test runs. I had very little time to adapt. 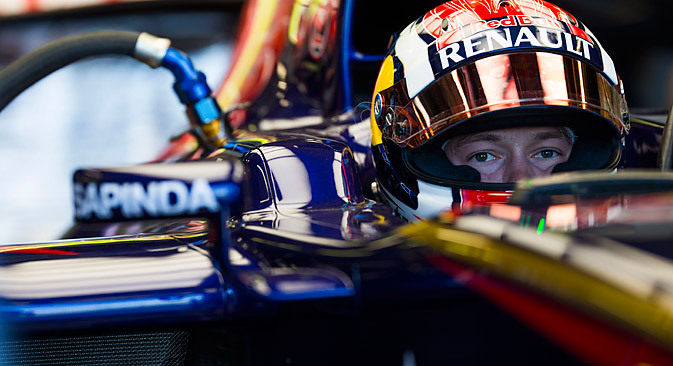 The main thing for Kvyat is to get used to everything quickly, including the growing interest in him personally. There is constant contact with the media, pressure from the team and other drivers. I think that if he learns how to handle all that, he will cope with everything," Petrov said. Based on materials published by Kommersant, Izvestia, and championat.com.